Dutch company Tempohousing is best known for their shipping container student dorms, but they also designed this brilliant building for the Dutch branch of the Salvation Army. A facility was needed for temporary housing of Salvation Army clients, sometimes as an alternative to jail for petty crimes. 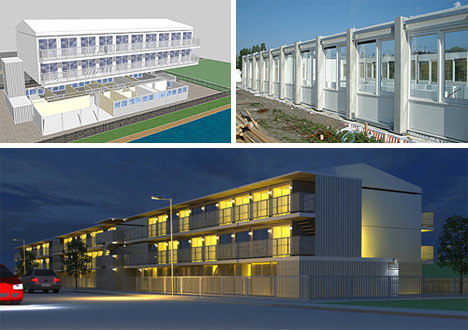 The ground floor of the building is made of traditional materials and is used for office and social space; the second and third floors are made of shipping containers and are used as individual housing units for tenants.